The Mullet run has begun!! Right on Que, the fall mullet migration-known as the “mullet run”- started on September 1st. This is the most exciting time of the year for anglers to get out and watch a myriad of species blasting mullet of all sizes as they start their annual migration toward the south for the winter. “Pods” or “schools” of mullet migrate along the near-shore waters and everything that swims along the coast can be seen feeding on them. 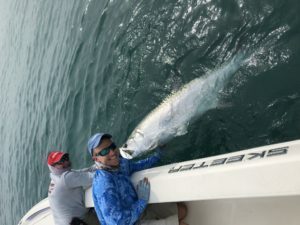 Tarpon are one of the most exciting species that we find feeding among these schools of baitfish. They blast through the schools knocking mullet high into the air. Cartwheels, back flips, and all sorts of other gyrations can be seen as fish to over 100 pounds aggressively feed on these silver morsels. Snook, giant redfish, bluefish, sharks, and even king mackerel can also be caught while fishing near these bait pods. 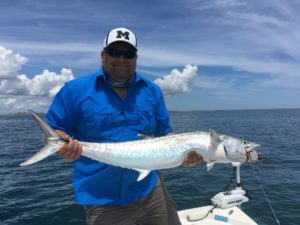 The king mackerel in particular can be as exciting to watch as the tarpon on some days. The kings “sky rocket through the mullet school picking off one baitfish at a time. The remind me of rockets blasting off of the launch pads because they often reach heights of 5 to 8-feet as they reach the apex of their attack. It only fitting that many of these launches occur right in the shadows of the Atlas, Delta, and Space X rocket gantries at the Kennedy Space center. So if you are ready for a visual experience to match the fishing experience you need to get out with Captain Justin Ross or myself while the mullet run is occurring this fall. Until next time….Catch a memory!!! !